Sweet Potato Soup that is healthy, easy, mega creamy (WITHOUT any cream), and wonderfully comforting! This Sweet Potato Soup recipe is loaded with flavor and intentionally easy and delicious while unintentionally gluten free, dairy free and crazy healthy! 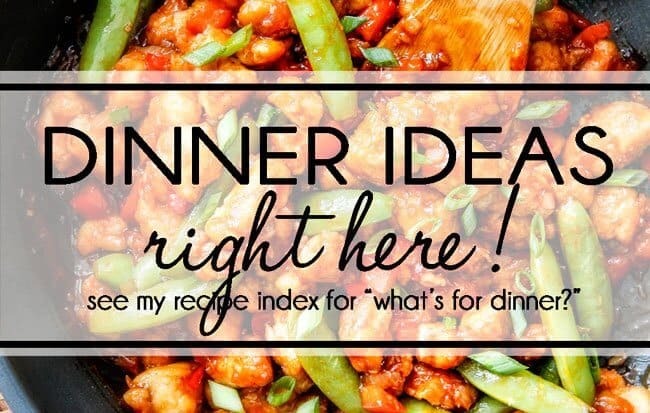 It can be made in the crockpot or stove top for an easy dinner any night of the week! Thank you McCormick® for sponsoring this Sweet Potato Soup recipe post. All opinions are my own. Nothing screams comfort like a thick, silky bowl of warm soup. And nothing says easy like a chop, dump and slow cooker soup. 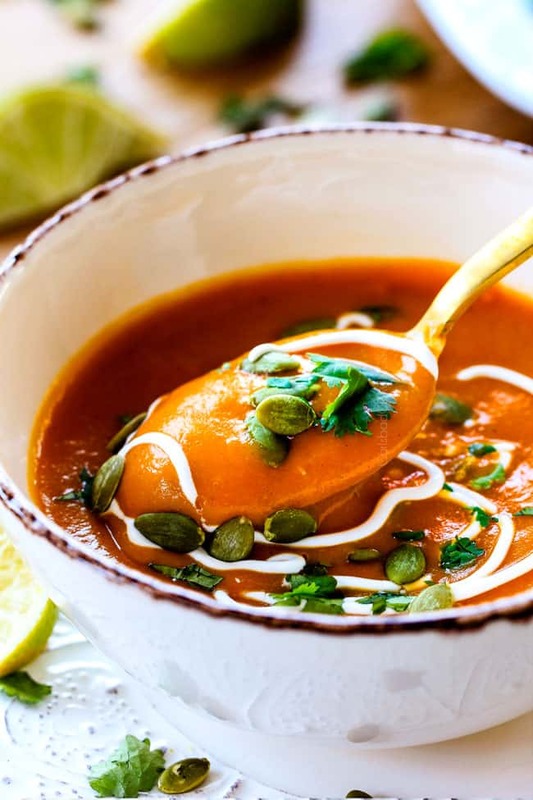 Mash the two together and we have Slow Cooker Chipotle Sweet Potato Soup that will warm your insides and make you smile on the outside – especially when you come home to the aroma of dinner waiting for you! Gotta love easy, make ahead, stress free dinners! The ease of this Sweet Potato Soup is just an added bonus to the crazy delicious taste. I would devour this Sweet Potato Soup even if it took hours of prep and had the nutritional value of a bowl of white rice. It’s that good. It’s so good, I chose to make it for my family when there were staying with me a couple weeks ago, and the oooooohs and ahhhhhhhs went on for days. I love appreciative eaters. While I find many Sweet Potato Soup Recipes fall into the one note bland category, this Chipotle Sweet Potato Soup boasts a harmonious blend of layers of flavor so you won’t even miss calories. It is also customizable with added yogurt, cream, nuts, seeds etc. This Sweet Potato Soup also makes delightful leftovers so you can meal prep for lunch or dinner and enjoy Sweet Potato Soup all week – while only “making dinner” once! Are you in love with Sweet Potato Soup yet?! 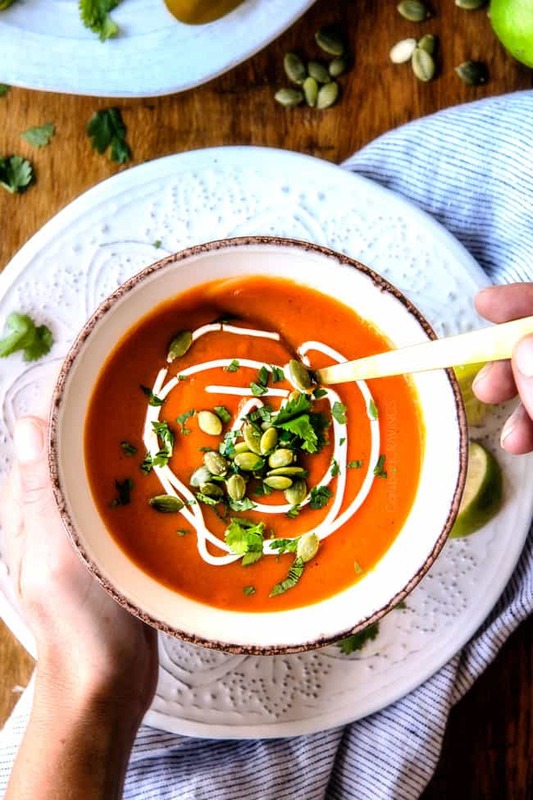 Is Sweet Potato Soup Good For You? If those aren’t reasons alone to love Sweet Potato Soup, how about the fact that sweet potatoes are healthy! If you aren’t a sweet potato fan, I am pretty confident this Sweet Potato Soup will turn you into one (as well as this Sweet Potato Casserole with Marshmallows and Pecan Topping and these Herb Scalloped Sweet Potatoes with Bacon and Gruyere), and if you are a sweet potato fan, then you know just how nutritious and delicious sweet potatoes can be! 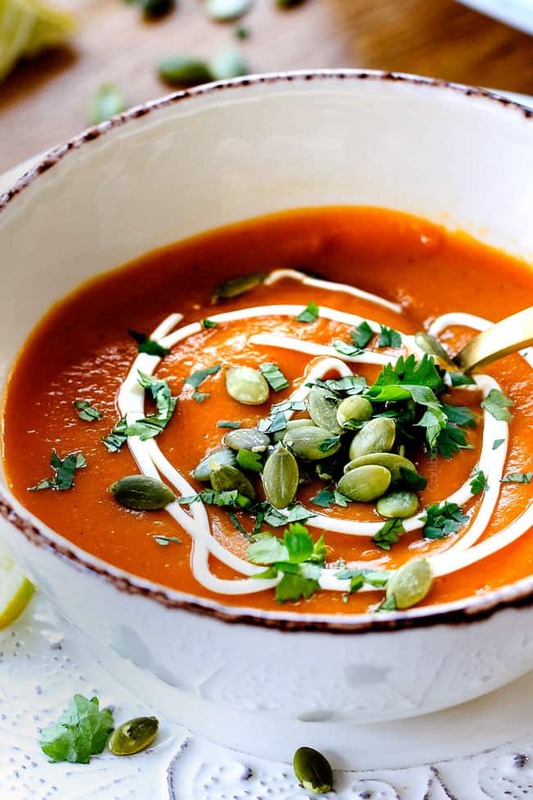 This Sweet Potato Soup is an entire main course packed with vitamins and minerals because sweet potatoes are nutritional powerhouses. They are packed with vitamin A, vitamin C, vitamin B, potassium, magnesium, beta-carotene and dietary fiber. Thank you, sweet potatoes. My grocery store calls sweet potatoes garnet yams. So look for garnet yams or your sweet potatoes might actually be white inside! If you aren’t sure, ask someone working in the produce section to help you out. Purchase sweet potatoes that are firm and free of blemishes. Scrub the outsides of the potatoes clean because even though you are peeling the potatoes, they can still leave grit behind. Chop sweet potatoes into 1″ cubes. Try and chop them relatively uniform in size so they cook evenly but don’t stress too much about it. It is not as critical because we are pureeing the soup. You will just need to cook until the largest potatoes are tender. How to Season Sweet Potato Soup? Sweet Potato Soup begins with an aromatic base of onions and garlic. We spice things up with our fiestalicious seasonings of ground cumin, chili powder, smoked paprika, dried oregano, salt, cinnamon and chipotle powder. I chose to use chipotle powder as opposed to chipotle peppers in adobo sauce as the heat level can vary vastly between peppers and I wanted a uniform spice level. If you love and know your adobo peppers, then feel free to sub them for the powder. Can I Make Vegan Sweet Potato Soup? Absolutely! Simply replace the chicken broth with vegetable stock. You will want to add additional salt to taste. It starts by adding our chopped sweet potatoes, Granny Smith apples, onions, garlic and chicken stock to the slow cooker. 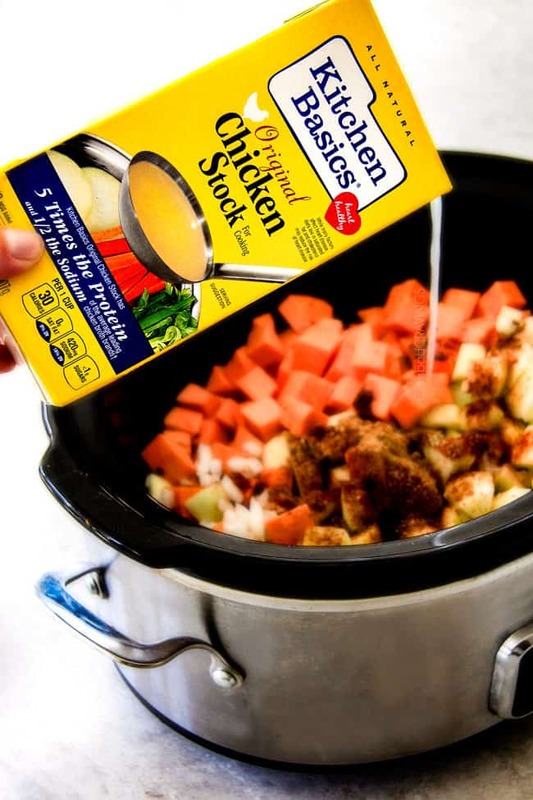 The Kitchen Basics Original Chicken Stock is my favorite stock to use in soups and adds a deeper flavor than just chicken broth in an all-natural healthy way. In fact, Kitchen Basics Original Chicken Stock is certified heart-healthy by the American Heart Association. win-win! The chicken stock is made by slow-simmering chicken and vegetables with a blend of the finest quality herbs and spices. It’s ideal for soups, sauces, braising meats and chicken. It simply makes everything better without any extra effort on our part! Let the Sweet Potato Soup cruise in the slow cooker until the potatoes are tender. At this point you can either use an immersion blender to blend your soup to ultra smooth deliciousness or work in batches to puree your soup in your blender. If using your blender, you will want to take care to let smoke escape while you are blending or the top will blow off and the contents explode all over your kitchen. You won’t have this problem as long as you leave a corner of your blender open so the steam can escape. Sweet Potato Soup takes less than 30 minutes on the stove top! You’ll simply saute your onions, sweet potatoes and apples to enhance the flavors along with garlic then add all of the seasonings and chicken broth. Simmer the soup until the potatoes are fork tender then either use an immersion blender or traditional blender and blend until smooth. I personally prefer the blender because I find it yields a smoother soup, but it’s totally your call. What To Add to Sweet Potato Soup? How do you thicken up Sweet potato soup? 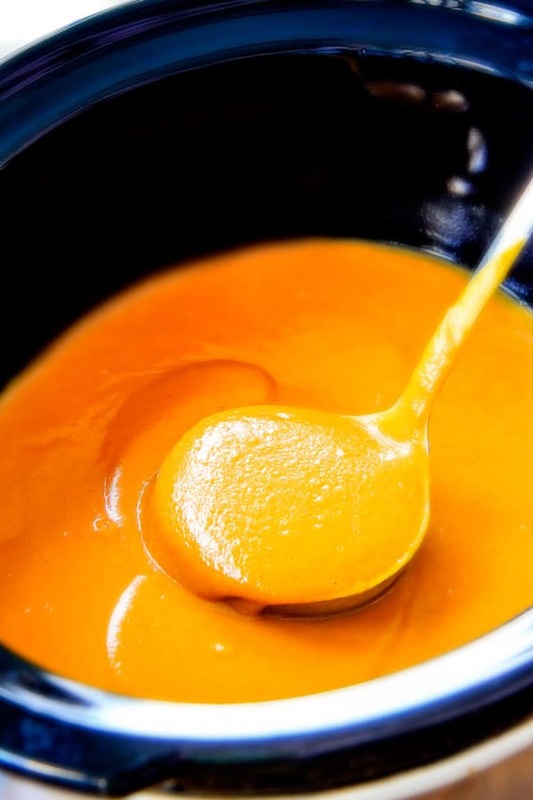 Cornstarch: Remove some broth from the Sweet Potato Soup and whisk in 1-2 tablespoons cornstarch with a fork until smooth then whisk it back into the soup. For the stove top, simmer for 5 minutes or so until thickened. For the crockpot, turn slow cooker to high until thickened, about 20-30 minutes, stirring occasionally. Flour and butter: Mix equal parts flour and softened butter together with a fork so it becomes a thick paste and almost forms a ball. You will want 2-4 tablespoons each, depending on how thick you want the Sweet Potato Soup. For the crockpot, turn slow cooker to high until thickened, about 20-30 minutes, stirring occasionally. What Meat Goes with Sweet Potato Soup? This Sweet Potato Soup goes well with practically everything from Brisket to Ribs, but I particularly love it with Mexican proteins to keep the theme going like Carnitas, Barbacoa Beef, Carne Asada and Mexican Chicken. What Should I serve with with Sweet Potato soup? Can I Prep Sweet Potato Soup Ahead of Time? Absolutely! You can prep almost all of the ingredients for this Sweet Potato Soup a day ahead of time to make it come together in minutes. The Granny Smith apple is the only item I wouldn’t prep in advance. You can chop your onions and garlic and place them in an airtight container in the refrigerator. You can measure out all of the seasonings and store them in a plastic aright bag. Lastly, you can wash, peal and chop your potatoes ahead of time but they will need to be submerged in water, covered and refrigerated to prevent them from browning. How to Store Sweet Potato Soup? 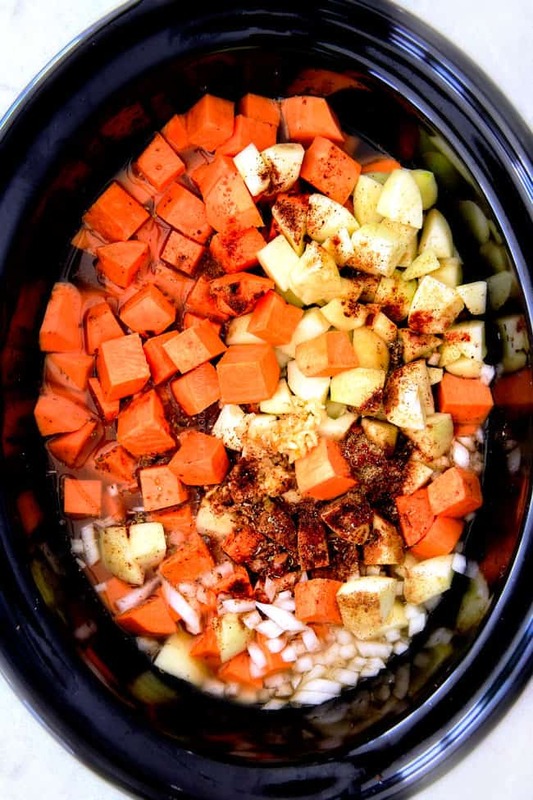 Crockpot: Once your Sweet Potato Soup has cooled to room temperature, you can remove the ceramic insert from the slow cooker and put the whole pot (lid on) in the refrigerator. Stove: You can place the entire soup put in the refrigerator or transfer the soup to an airtight container and store in the refrigerator. HOW LONG WILL SWEET POTATO SOUP KEEP IN THE REFRIGERATOR? Sweet Potato Soup should be stored in an airtight container and kept in the refrigerator. When stored correctly, it is good for three to five says. Can I Make Sweet Potato Soup Ahead of Time? Yes, in fact, I highly encourage it! The flavors of this Sweet Potato Soup only improve with time, so I actually think this Sweet Potato Soup tastes better the next day. That means this soup makes fantastic leftovers. The Sweet Potato Soup will thicken in the refrigerator so just whisk in a little milk before reheating. HOW DO I REHEAT Potato Soup? Crockpot: remove from the refrigerator, place your ceramic crockpot insert back into your crockpot and heat on low for 1-2 hours. Stove: transfer Sweet Potato Soup to a soup pot or sauce pan (depending on volume) and and heat over medium low heat, stirring occasionally until heated through. Microwave: transfer individual servings of Sweet Potato Soup to a microwave-safe dish, cover with a microwave-safe lid or paper towel. Microwave for 2 minutes, stir, then continue to microwave for 30-second intervals, if needed. Can I Freeze Sweet Potato Soup? Yes! Unlike my Crockpot Potato Soup, this Sweet Potato Soup freezes well because there is not any dairy and the soup is completely pureed so you don’t need to worry about the texture of the potatoes becoming funny. 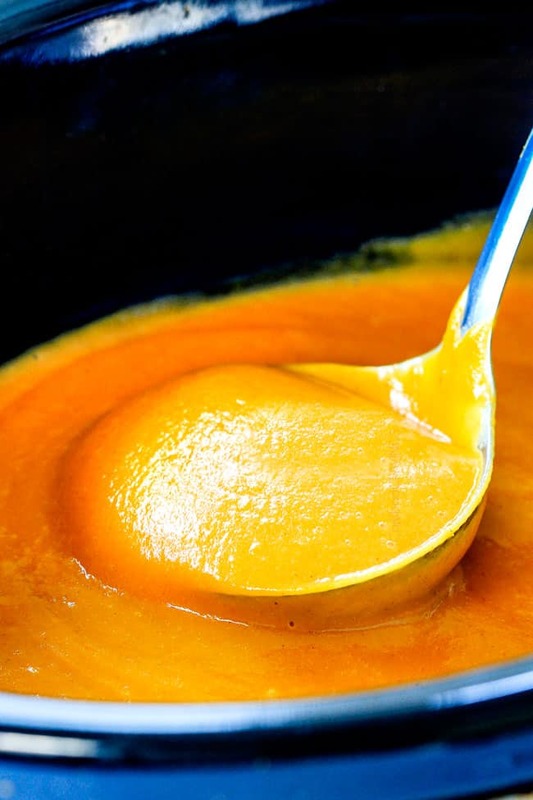 Add Sweet Potato Soup to freezer safe containers or freezer size bags and squeeze out any excess air to prevent freezer burn before sealing..
Want to try this Sweet Potato Soup Recipe? 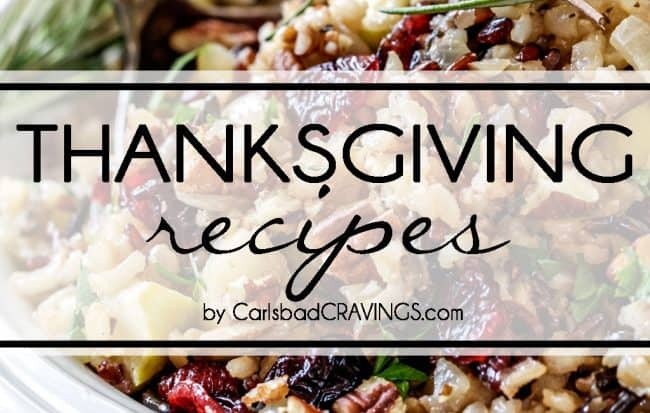 Pin it to your Slow Cooker, Soup, Dinner, or Healthy Board to SAVE for later! This mega creamy (WITHOUT any cream), Slow Cooker Chipotle Sweet Potato Soup is wonderfully comforting and positively can't-stop-slurping-delicious! It's is loaded with flavor and intentionally easy and cravilicious while unintentionally gluten free, dairy free and crazy healthy! Add all of the ingredients to the slow cooker except lime juice. Cook on Low for 6-8 hours or on High for 3 ½ -4 ½ hours OR until potatoes are very tender. Working in batches, add slow cooker contents to your blender. Blend until very smooth, being careful to let smoke escape or it will explode (I leave a corner open and cover with a paper towel). Return pureed soup to a large soup pot/Dutch oven. Repeat until all soup has been pureed. Stir in lime juice and salt and pepper to taste (I add an additional ½ teaspoon salt). Stir in additional chipotle chili powder for spicier if desired. Garnish individual servings with sour pumpkin seeds, cilantro and sour cream (optional). Heat one tablespoon olive oil over medium heat in a large Dutch oven/soup pot. Add onions, sweet potatoes and apples, and cook until onions are softened, about 5-7 minutes. Add garlic and saute 30 seconds. Add chicken broth and all seasonings. Bring to a boil, cover and reduce to a simmer for 15 to 20 minutes or until potatoes are fork tender. Use an immersion blender to blend until smooth or working in batches, add soup to your blender. Blend until very smooth, being careful to let smoke escape or it will explode (I leave a corner open and cover with a paper towel). Return pureed soup to a a separate pot. Repeat until all soup has been pureed. This soup has a mild kick and but not too adult spicy in my opinion. If you want a very kid friendly soup, then reduce or eliminate Chipotle Powder and add to taste at the end of cooking. I’m thrilled you loved it Ally! I’m married to a spice head also so I always have to take whatever spice level he likes and half it for my readers :)! That is awesome you are married to a Carlsbad native and get to visit – I hope you have a wonderful stay!